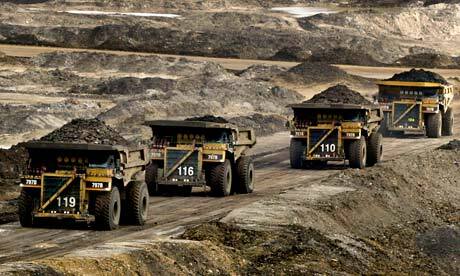 By Stephen LeahyHundreds of activists including Bill McKibben and Naomi Klein are going into the heart of Canada's tar sands this week–not to protest the destruction of the local environment, but to pray for the 'healing' of land and the people. By Vincent McDermottOver 500 activists and environmentalists joined First Nations elders for a 14 kilometre Saturday morning prayer march through the oilsands, braving the acrid smell of sulphur and a cloud of dust for the fourth annual Tar Sands Healing Walk. Unlike last winter’s Idle No More protests--which featured road blocks, flash mobs and conventional protests--organizers say the Healing Walk is a spiritual exercise, where elders from several First Nations communities pray for the healing of land affected by oilsands development. “We are not anti-oil development, but let’s do it in a sustainable way that’s going to be good for the environment,” said Chief Allan Adam of the Athabasca Chipewyan First Nation, which is based in Fort Chipewyan, downstream from oilsands development. While Adam says he is not opposed to oilsands development--his community holds millions of dollars in industrial contracts with several major oil corporations and is the community's main source of employment--he spoke bluntly about the contempt for industry he says many aboriginal people have. “The pace and scale of this development also bring with them destruction, risk and devastation,” he said. “Do we say yes to jobs while sacrificing our ability to pass on our culture to the next generation? Are we OK to accept a pay cheque while we watch our land and water being turned toxic, preventing us from hunting and fishing? We will not be forced to sacrifice our culture and way of life.”Comment: For more on the subject, see Moccasins on the Ground vs. Keystone XL and Longest Walk 4 Return to Alcatraz.